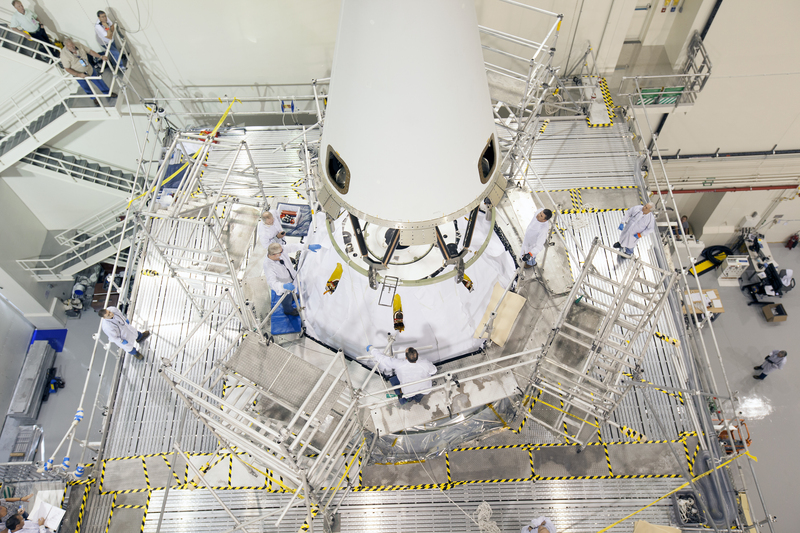 Technicians and engineers at NASA’s Kennedy Space Center in Florida installed the Launch Abort System atop the Orion spacecraft Friday as launch preparations continue for December’s launch. The LAS, as it is known, will not be active during this flight test but would, during future flights, be equipped to act within milliseconds to pull the spacecraft and its astronaut crew away from its rocket so the Orion could parachute back to Earth safely. For the upcoming Orion flight test, the LAS will have an active jettison motor so it can pull itself and the nose fairing away from the spacecraft just before Orion goes into orbit. I would have assumed that a Launch Abort System would have been standard protocol. Clearly not, but I guess I am a little puzzled why not? This flight won’t have a crew, so there is no reason to have an active LAS. Only need to have active jettison rockets to pull the LAS away from Orion once it gets to orbit. no crew this flight so no need for an abort system . . . unless you want to retrieve a relatively undamaged test capsule for analysis of what an abort system does to a capsule and hence the crew . . . but why bother putting an expensive abort system on top if the expected performance is a success. Actually, they are going to re-fly this very Orion spacecraft to test the active LAS much as you describe. I believe this launch abort test will take place in 2015. I have oft think about why is a spacecraft for deep space exploration not build up / jointed together in the orbit around the globe ? At this way will a larger unit could be send and also with more quickly speed with many boaster rocket joint. you could make the trip faster with more fuel to get a higher speed but you also have to carry more fuel to slow down at the other end and even more fuel to make a faster return trip . . . every bit of fuel you carry to slow down or come home means more fuel to go out faster . . . there is a balance between mass, speed and payload that makes a small slow flight a lot less expensive. a larger mission could be assembled and fueled on orbit but it would take many launches . . . you then have to decide if it will be a small crew getting there and back fast or a large crew going slow . . . a large crew has many advantages . . . each person on the crew can be more of a specialist instead of being a pilot/doctor/navigator/mechanic/scientist/laborer . . . a larger crew also can do more work while they are there . . . if there are enough people in the crew you could have some of them doing nothing but make a radiation shielded base camp (bury it) and maintain it while specialists do more scientific work . . . with a more secure base the crew could stay longer and do even more work. a small crew on a fast flight would have very little time on the ground to do any real work but would be exposed to less radiation. everything you want has to be traded for something you need and it all has to cost no more than you can afford. ideally . . . you would have lots of money and time . . . you could send unmanned flights to carry supplies and tools to land before the people get there . . . they might even include an automated chemical factory to manufacture fuel for the return flight and air to breathe and water to drink while you are there . . . you could even land the sections of a large habitat and have it ready to move into when the people arrive . . . everything could be monitored from earth to be sure that everything is working before the people take off . . . but i dream such lovely dreams! as for the “wheel” in orbit with spinning artificial gravity? . . . it could have been built from discarded shuttle oxygen tanks if they had a few modifications before taking off to make taking them apart and rejoining them easier . . . 18 shuttle oxygen tanks joined in a ring with another two where an axle would be makes a huge structure . . . once again it’s only money that stopped it. you are neglecting the fact that disgarded oxygen rings would also need to be keept in orbit. so would require more fuel to keep em there. I’m just Happy this is happening and that all goes well. A few years ago I was afraid the day would never come, due to politics,funding etc.. I am glad we retained some jobs for the people from the Shuttle program and hope more and more of them come back as this progresses forward. Godspeed NASA. Any timeline on when the abort system will be tested on future flights? We tested the full launch abort system in 2010 and will perform another test called Ascent Abort-2. You can watch the video of the first test here, and find out more about the launch abort system here. 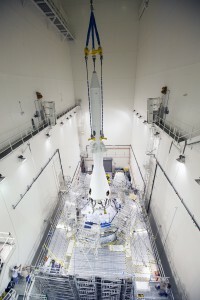 Thanks for finally writing about > Launch Abort System Installed for Orion Mission | Orion < Loved it!